(Command key) – On some Apple keyboards, this key also has an Apple ( ) logo (Source: OS X keyboard shortcuts). 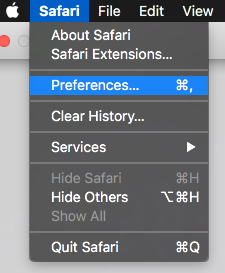 In the center pane are several options. Under 'History' click the link titled 'Clear History...'. From the 'Menu bar', click the 'Tools' tab and select 'Internet Options'. In the pop-up, Un-check the box titled ‘Preserve Favorites website data’.